Amazing! Hard to believe the fantasy season is almost over! For most leagues, this is either the last week, or, the next to the last week, for regular season fantasy action. These games are important for those fantasy coaches who are looking for a playoff spot…selecting a good fantasy team QB is a must. Fortunately, this week, there will be few QBs off this week. Also, many of the top fantasy QBs like Oklahoma State’s Brandon Weeden (photo, thanks Scout.com) have some favorable matchups. Brandon Weeden – Oklahoma State (at Kansas State): Weeden and his Cowboys may be coming off their first loss of the season last week vs Nebraska, but, they get a chance to redeem themselves vs a bad Kansas State defense….a defense that has been lit up this year like a frat house with a stolen beer truck. Weeden should post big numbers this week. Taylor Martinez – Nebraska AND Blaine Gabbert – Missouri: Look for another Big XII shootout in Lincoln this weekend from these two QBs….and it will be the last meeting of this long-running series as Nebraska heads to the Big Ten next season. Dan Persa – Northwestern AND Ben Chappell – Indiana: A possible shootout in the works, as both QBs have had some huge games this season…and Chappell does well at home. Christian Ponder – Florida State AND Russell Wilson – NC State: This Thursday night matchup features the two best QBs in the ACC…and both are worthy plays this week, as I see this game being high-scoring. Cam Newton – Auburn (at Ole Miss): Ole Miss cannot stop Newton…unless they use nuclear devices. 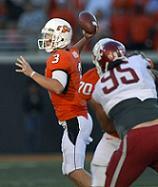 Darron Thomas – Oregon AND Matt Barkley – USC: This Pac-10 showdown is not going to be a defensive one, for sure. Play them both this week. Robert Griffin – Baylor (at Texas): Imagine…Baylor is the ranked team in this game, not Texas. Still, this will not be an easy game for Griffin in Austin this weekend. Dominique Davis – East Carolina (at UCF): UCF has one of the best defenses in the nation…and Davis is not going to put up anything on the Knights defense.